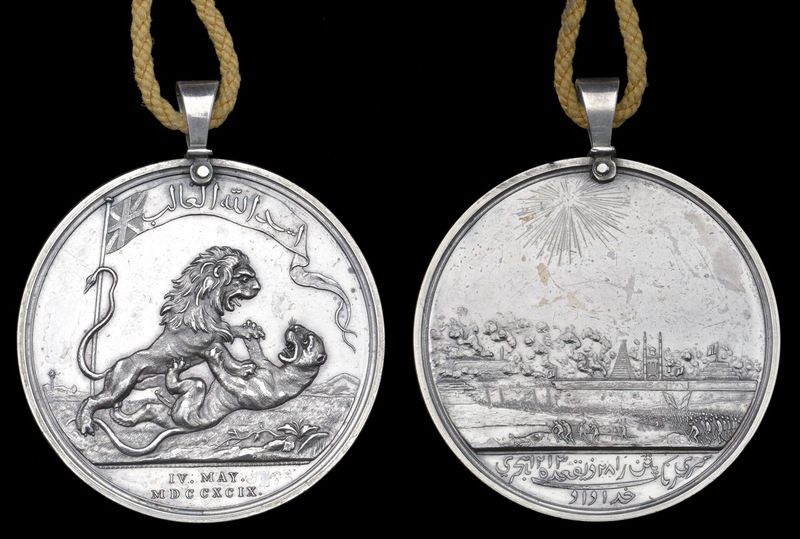 The Honourable East India Company (HEIC) Medal for Seringapatam awarded for the capture of Tipu Sultan’s Mysore Fortress has always been one of my favorite medals. 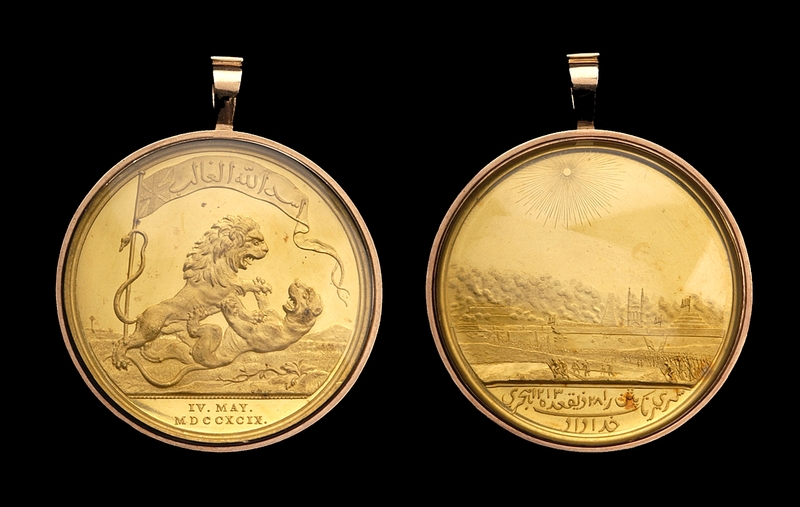 Part of the medal’s appeal is the beautiful obverse depicting the British Lion attacking the Mysore Tiger, symbolically representing Tipu Sultan. Yet the Seringapatam Medal also represents a fascinating chapter of British involvement in India relating to the Napoleonic Wars. Ten years ago, I had the opportunity to visit Seringapatam (now known as Srirangapatna) and walked the decaying battlements with book in hand to relive history as it should be done. Brief information on Tipu Sultan and the last three Mysore Wars (from a British perspective) is given below to give the reader some background information regarding this fascinating medal. Tipu Sultan’s father, Haider Ali, quickly rose through the ranks due to his military skills to eventually become sultan and de facto ruler of the Kingdom of Mysore. Haider Ali invaded Carnatic in 1780 after the British seized the French-controlled port of Mahé and had early successes against the British forces. In 1781, he was defeated by Sir Eyre Coote three times in succession in the battles of Porto Novo, Pollilur, and Sholinghur and died a year later of cancer. Tipu Sultan, fighting along side his father, would continue the war but made peace withe the British in 1784 with the signing of the Treaty of Mangalore. In 1790, Tipu Sultan attacked the State of Travancore, an ally of Great Britain. In retaliation, British Generals Meadows and Abercromby attacked South Mysore. The following year, Lord Cornwallis launched a major offensive driving deep into Mysore. After securing Bangalore, Cornwallis defeated Tipu Sultan at Arakere and drove towards Seringapatam. A shortage of supplies forced him to withdraw. Later in 1791, Cornwallis again took to the offensive by advancing on Seringapatam for the second time and forced Tipu Sultan to terms under threat of siege. A treaty was signed with Tipu Sultan on the 18th of March 1792 conceding a significant portion of land to the British as well as a substantial indemnity. The Honourable East India Company awarded medals for the Third Mysore War to native troops under the command of Cornwallis, Abercromby & Meadows against the forces of Tipu Sultan. However, this was only a temporary cessation of hostilities as our story continues. With Egypt in the possession of the French, a strong alliance between France and Tipu Sultan could have further threatened Britain’s territorial possessions as well as the trade with India. The threat of this alliance was all the pretext Governor-General Earl Mornington (Richard Wellesley) needed to order the planning of the invasion of Mysore (see Figure 1) and remove Tipu Sultan as a threat. An alliance was formed with the Nizam of Hyderabad in which he would provide troops and cavalry in a joint expedition to Mysore. I, therefore, direct that you enter the territory of Mysore with the army now assembled under your command, with as little delay as possible, and that you proceed to the siege of Seringapatam. 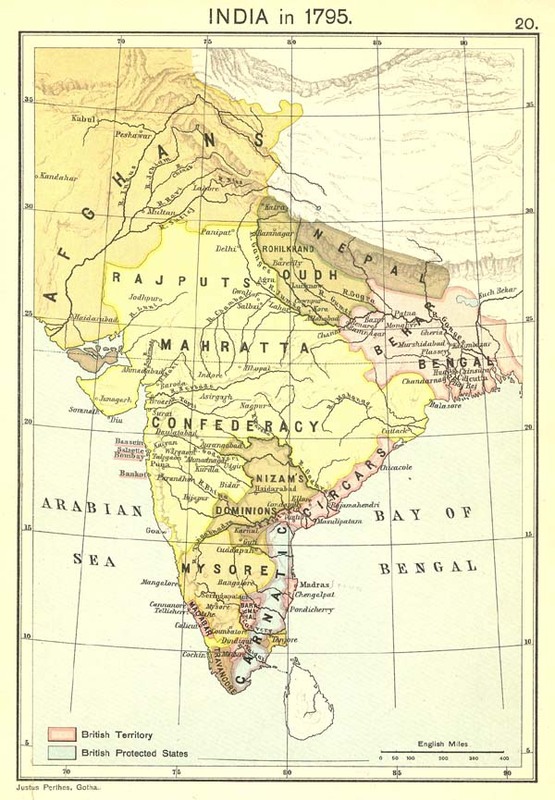 Figure 1 – Joppen Map of India 1795. Image courtesy of Dr. Frances Pritchett, Columbia University. Figure 2 – Major General George Harris. Image from author’s archive. Major General Stuart’s Division entered Mysore and while awaiting orders from Harris, skirmished with Tipu Sultan’s forces at or near Sedaseer on the 6th of March, 1799 resulting in 143 British and Native Troops killed, wounded and missing. Tipu Sultan’s forces suffered severe casualties. Twenty-one days later, Harris’ Corps would rout Tip Sultan’s forces in an action near Mallavilly with only a loss of only 66 British and Native Troops killed, wounded and missing. Tipu Sultan’s forces would suffer nearly 2000 killed and wounded and would begin their retreat to Seringapatam with Harris’ Army in pursuit (2). Tipu’s Seringapatam fortress is strategically located on an island in the middle of the River Cauvery as shown in a map of the assault in Figure 3 (2). 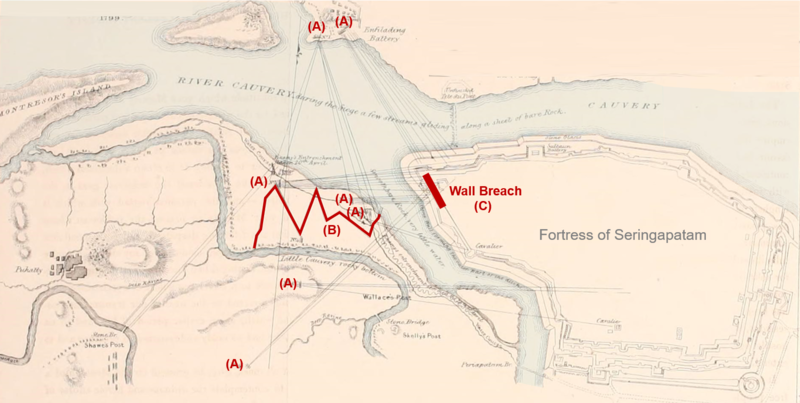 This map shows the strategic placement of the siege battery positions (A), the trenching approaches for the final assault (B) and the eventual breach in the walls (C) where Harris’ main force would enter the fortress. Major General Harris describes the reduction of the fortress in this excerpt from his dispatch to the Earl of Mornington dated the 7th of May, 1799 (2). The fire of our batteries, which began to batter in breach on the 30th of April, had, on the evening of the 3rd instant, so much destroyed the walls against which it was directed, that the arrangement was then made for assaulting the place on the following day, when the breach was reported practicable. The troops intended to be employed were stationed on the trenches early on the morning of the 4th, that no extraordinary movement might lead the enemy to expect the assault, which I had determined to make in the heat of the day, as the time best calculated to ensure success, as their troops would then be least prepared to oppose us….. Figure 3 – Assault plan for Seringapatam. Image from author’s archive. At one o’clock the troops moved from the trenches, crossed the rocky bed of the Cavery under an extremely heavy fire, passed the glacis and ditch, and ascended the breaches in the Fausse Braye, and rampart of the fort, surmounting in the most gallant manner every obstacle which the difficulty of the passage, and the resistance of the enemy presented to oppose their progress. Major-General Baird had divided his force for the purpose of clearing the ramparts to the right and left; one division was commanded by Colonel Sherbrooke, the other by Lieut.-Colonel Dunlop; the latter was disabled in the breach, but both corps, although strongly opposed, were completely successful. Resistance continued to be made from the palace of Tippoo for some time after all firing had ceased from the works; two of his sons were there, who, on an assurance of safety, surrendered to the troops surrounding them, and guards were placed for the protection of the family, most of whom were in the palace. It was soon after reported that Tippoo Sultaun had fallen. Syed Saheb, Meer Saduc, Syed Gofar, and many others of his chiefs were also slain; measures were immediately adopted to stop the confusion, at first unavoidable, in a city strongly garrisoned, crowded with inhabitants, and their property in ruins, from the fire of a numerous artillery, and taken by assault. The princes were removed to camp. In the palace we found a man who, on being severely threatened, said that the Sultaun was killed in attempting to escape through the Northern Sally Port, and offered to conduct us to the body. We accordingly proceeded thither, and under a slaughtered heap of several hundreds, many of whom were men of consequence in his service, had the pleasure to discover the body of the Sultaun, he had been shot through the head and body, and was quite dead, I caused him immediately to be put into a palanquin, and conveyed to the palace, where the body was identified by some of the principal men who had fallen into our hands, and by two of the eunuchs belonging to his Haram. Many paintings were produced in England soon after the siege to glorify this significant victory. 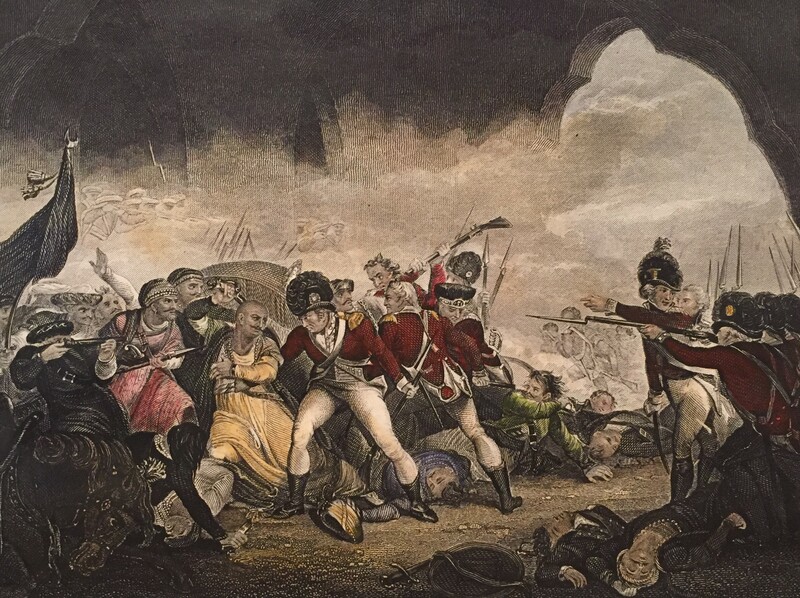 One such painting by Henry Singleton was “The Last Effort and Fall of Tippoo Sultan” (alternate English spelling), depicting Tipu Sultan fighting to his death. Figure 4 is the engraving by J. Roger reproduced from the painting. Figure 4 – “The Last Effort and Fall of Tippoo Sultaun” after the Henry Singleton Painting. Image from author’s archive. Casualty returns for the assault and capture of Seringapatam are shown below to gauge the bloody price for taking Seringapatam (2). With the exception of a couple of Madras and Bengal Native Infantry Regiments, the British Regular Army Regiments took most of the casualties from leading the assault on the breach. Over 8500 Mysoreans under Tipu Sultan were killed or wounded in taking Seringapatam. 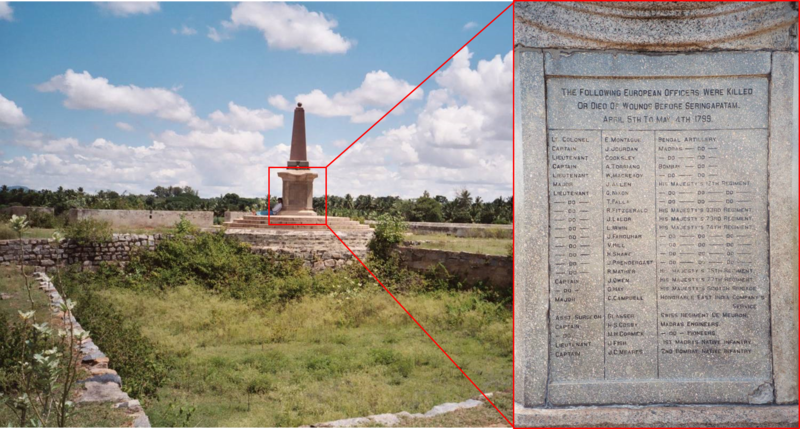 I took photographs of the memorial obelisk commemorating the Siege of Seringapatam in Figure 5 with its plaque engraved with the names of the British Officers who were killed or died of wounds. The obelisk was erected at the site of the breach in 1907 by the Government of Mysore and represents the only solace left for their ultimate sacrifice. Figure 5 – Obelisk and Memorial Tablet commemorating the dead British Officers. Image from author’s archive. In February, 1801, the Court of Directors of the Honourable East India Company gave orders for the preparation of 30 gold medals, 185 silver gilt medals, 850 silver medals, 5000 bronzed copper medals, and 45,000 pure grain tin medals. The medals were to be issued to dignitaries and the officers and men of the British and Honorable East India Company’s (Madras and Bombay) forces engaged in the battle on May 4th, 1799 (3). The Court of Directors further ordered that a warrant be made out to Mr. Matthew Boulton of the Soho Mint in Birmingham to strike the medals. The medal obverse and reverse was designed by C. H. Kuchler. The Honourable East Indian Officers did not receive permission to wear the Seringapatam Medals until 1815. British Officers would not receive permission to wear their medals until 1851. 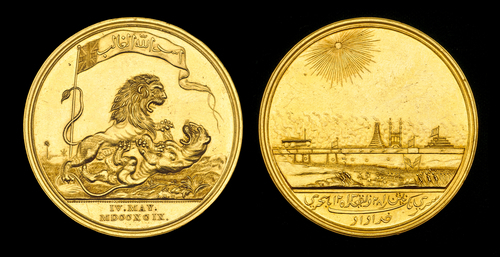 The obverse of the Seringapatam Medal features a British Lion overpowering a Tiger symbolically representing Tipu Sultan. It is probably no coincidence that this obverse would feature such a scene due to the nature of Tipu Sultan’s own use of symbolism against the British. A Union Flag bears an Arabic inscription translated as “The Lion of God is the conqueror” (3). Underneath has the date of the battle, IV May MDCCXCIX. Thirty gold medals were produced for distribution to His Majesty, the Right Honorable Lord Melville, the Governor-General in India at the time, Marquis Cornwallis, the Nizam and his two Ministers, the Peishwah and his Minister, the Nabobs of Arcot and Oude, and the Rajahs of Tanjore, Travancore, Mysore, Coorg and Berar. Dowlut Row Scindia, the Commander-in-Chief, General Officers on the Staff employed in the Service, and for the Oriental Museum (3). Figure 6 illustrates the Seringapatam Gold Medal set in a glazed case, named on the edge and awarded posthumously to Major General Sir John Braithwaite, Commander-in-Chief Madras Army. This magnificent medal (ex-Brian Richie Collection) was sold at Dix, Noonan, Web on the 17th of September, 2004. Braithwaite was taken prisoner-of-war by Tipu Sultan in 1782 and held at Seringapatam. Figure 6 – The Seringapatam gold medal obverse/reverse (Soho Mint) as awarded to Major General Sir John Braithwaite, Image courtesy of DNW. 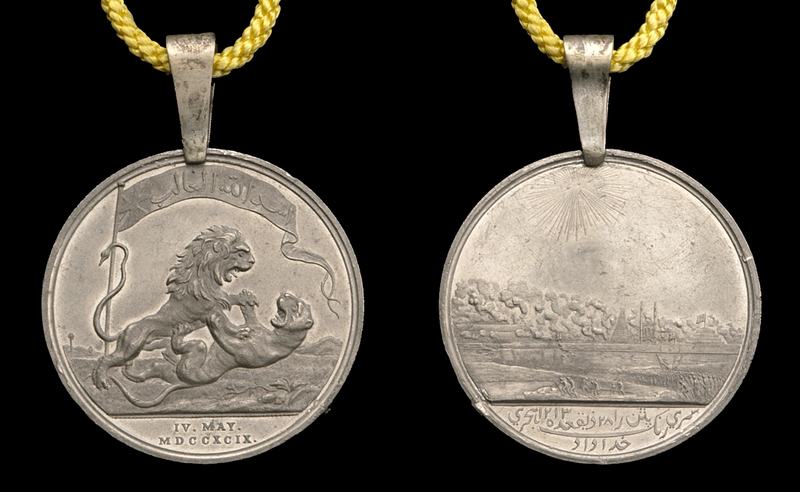 One hundred eighty-five silver gilt medals were produced for the Members of Council in May, 1799, for the Residents at Hyderabad and Poonah at the same period, and for the Field Officers and General Staff of the Army employed on the Expedition based on the 1800 returns sent by the Adjutant-General. Silver gilt medals for Officers belonging to the other Presidencies were forwarded as well (3). Figure 7 – The Seringapatam silver-gilt medal obverse/reverse (Soho Mint). Image courtesy of DNW. Eight hundred-fifty silver medals were produced for Captains and Subalterns, including such of the General Staff as are to be considered of those ranks (3). Figure 8 – The Seringapatam silver medal obverse/reverse (Soho Mint). Image courtesy of DNW. Five thousand bronzed copper medals were produced for Native Commissioned and Non-Commissioned Officers as well as Sergeants, Drummers or Fifers, and Trumpeters of European Corps, and to Conductors and others of the General Staff, considered as Non-Commissioned Officers. The number of returns for this class of medal were estimated at 4331 (3). Figure 9 – The Seringapatam bronzed copper medal obverse/reverse (Soho Mint). Image courtesy of DNW. Forty-five thousand pure grain tin medals were produced for Corporals, Gunners and Private Europeans, and for Naicks, Farriers, Native Doctors, Golun- dauze, Private Sepoys, Second Tindals, Lascars, Puckallies and Guides of the Native Troops. The number of returns for this class of medal were estimated at 42,450 (3). Figure 10 – The Seringapatam pure grain tin medal obvere/reverse (Soho Mint). Image courtesy of DNW. 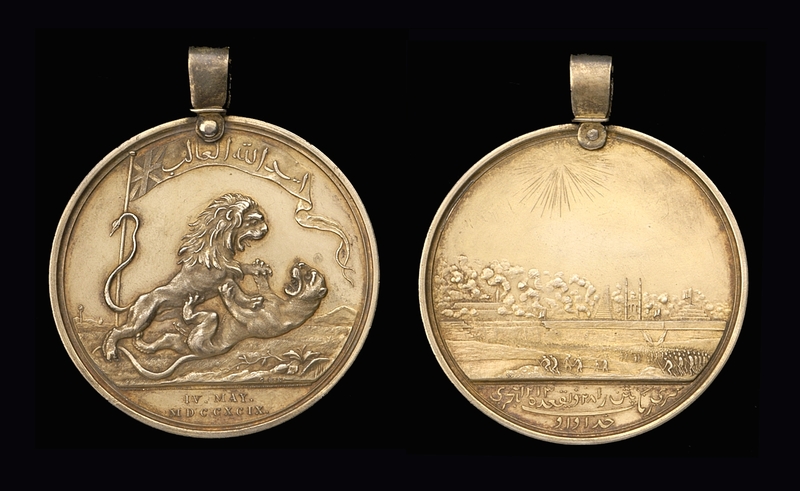 Similar Seringapatam Medals were also struck by the Calcutta Mint and issued in 1808 to native officers (gold) and men (silver) of the Bengal Presidency that took part in the siege. It is smaller in diameter that the Soho Mint medal by one-tenth of an inch and inferior in execution. Precedence in the issuance of previous Indian campaign medals prevailed with Calcutta-minted Seringapatam medals issued in gold to Bengal Native Officers and those of other ranks in silver. This conflicted with the policy of issuance (type of metal) for the Soho-minted medals presented to other British and native veterans of the campaign (3). Figure 11 – The Seringapatam Gold Medal obverse/reverse (Calcutta Mint). Image courtesy of Spink and Son. Two thousand & eighty-six silver medals produced at the Calcutta Mint (Figures 12 &13) were issued to Indian soldiers of the Bengal Presidency (4). 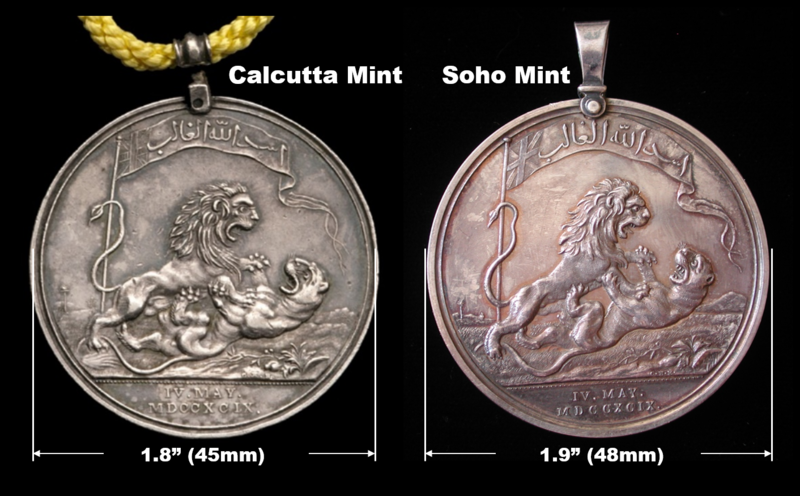 Medal diameters are the most distinguishing difference between the Calcutta Mint and Soho Mint medals as shown in Figure 12. 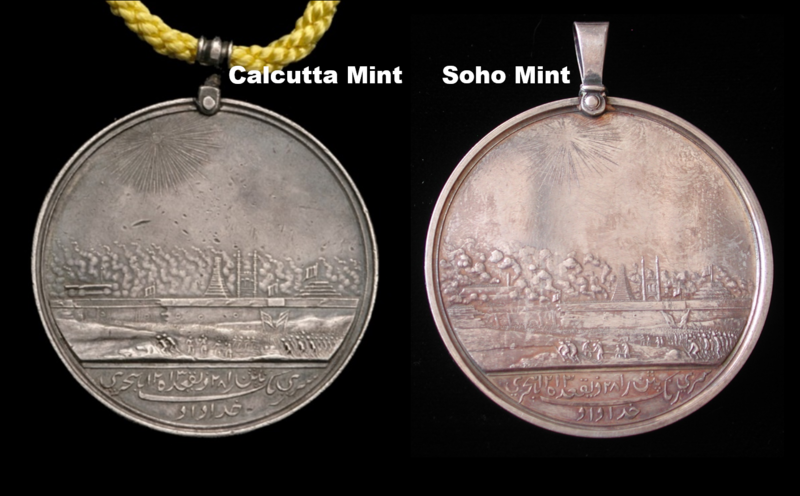 Visually, the inferior die engraving of the Calcutta Mint medal compared to the Soho Mint medal also makes it easy for the collector to spot the differences if you do not have a caliper. 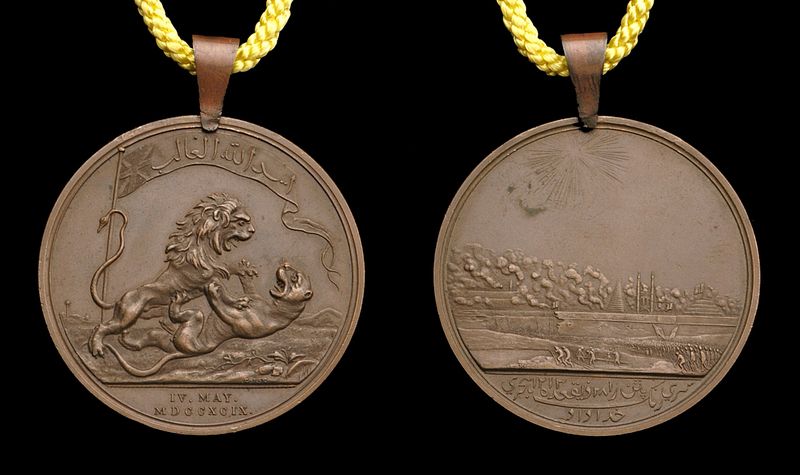 Comparing the “quality differences” of the lion manes between the two medal obverses is the first detail I look at. Muscle definition on the two animals is also more pronounced on the Calcutta Mint medal obverse. On the reverse, troop details and the smoke rising from Seringapatam is inferior on the Calcutta Mint medals as shown in Figure 13. Figure 12 – Calcutta Mint obverse (left) verses Soho Mint obverse (right). Image from author’s archive (copyright). Figure 13 – Calcutta Mint reverse (left) verses Soho Mint reverse (right). Image from author’s archive (copyright). 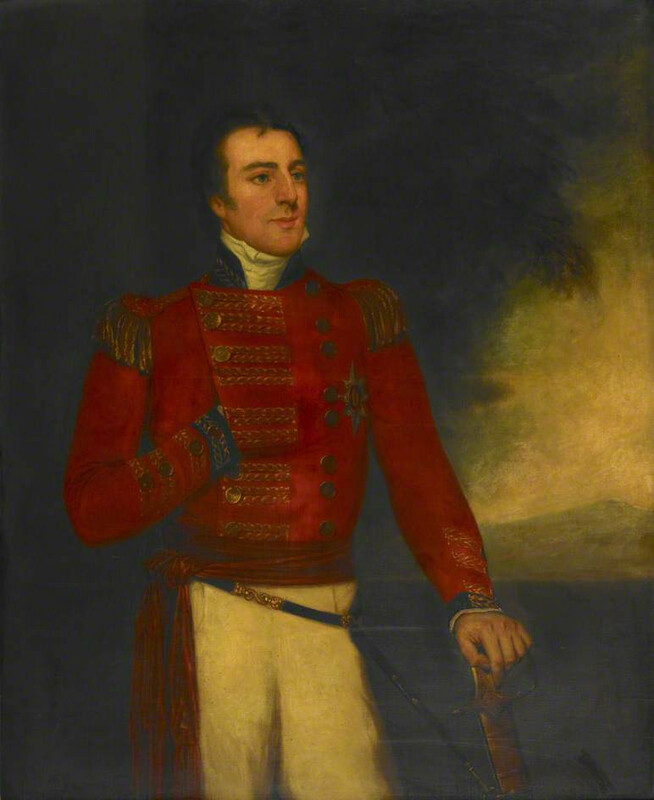 For Colonel Arthur Wellesley, commander of the 33rd Foot, the experience he gained in his role planning much of the logistics for the invasion of Mysore and later in command of the Nizam of Hyderbad’s contingent in General Harris’ campaign against Tipu Sultan would serve him well. After the departure of Harris’ Army, Wellesley would be appointed Governor of Seringapatam by his brother Richard, the Earl of Mornington. 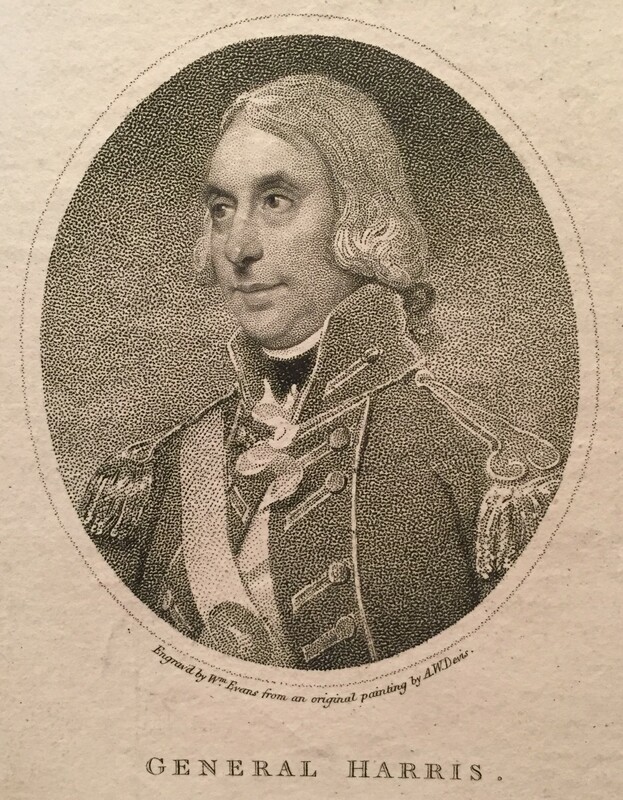 Wellesley would remain in India and be promoted Major General in 1802. His lessons in becoming a great military mind would be further honed at the outbreak of the 2nd Anglo-Maratha War in 1803. It would be this campaign where Wellesley would become known as the “Sepoy General”. More on that subject in the weeks to come in a future blog on Major General Arthur Wellesley and the Army of India Medals. Of course, Major General Sir Arthur Wellesley would rise to great fame as the Duke of Wellington at the end of the Peninsular War and his military legacy would crest in final victory over Napoleon at the Battle of Waterloo.